Welcome to the United States District Court for the District of New Mexico. 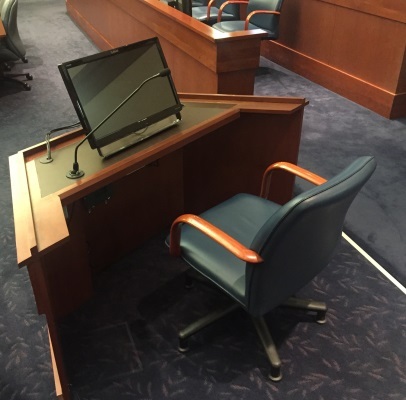 We pride ourselves on the successful integration of technology and justice: A majority of our courtrooms have been outfitted with the latest in courtroom technology, including the use of digital video and audio, evidence display, and Realtime transcription. Streamlining the litigation process through the implementation of advanced communication technologies has enhanced the Court's ability to meet the needs of the bar and the public, while preserving the dignity and fairness of the proceedings. Since people are five times more likely to remember something they both see and hear, audio/visual means of presentation increases both efficiency and juror comprehension. The Court encourages members of the bar to take advantage of this technology. With minimal training, attorneys can present photos, documents, objects, video, audio, and electronic presentations to focus juror attention on critical details. At the heart of our technology enhanced courtrooms is the Digital Evidence Presentation System (DEPS). The DEPS allows switching between displaying exhibits, playing video recordings, or presenting multimedia presentations with the push of a button. Some of the technology integrated into the courtrooms includes: a document camera, which can be used to display exhibits such as documents or medium-sized three-dimensional objects; HDMI and VGA connections to display multi-media presentations or images from a portable computer; a color video printer that can produce a color print of any image displayed through the DEPS; and annotation monitors located at the lectern and the witness box, which allow on-screen drawing to emphasize specific details for display throughout the courtroom. 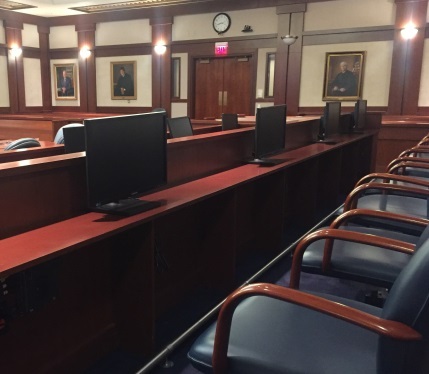 To make visual display efficient, 22" widescreen monitors are located on each counsel table, the Judge's bench, the courtroom deputy location, the witness box, and between each pair of jurors. Realtime transcription from the court reporter can be directed to computers at the Judge's bench and counsel tables (counsel must provide their own laptop computer). In addition, infrared assistive listening and interpreting is available to all participants. Technology-ready counsel tables provide quick-connect capability for video, audio, and Realtime transcription. 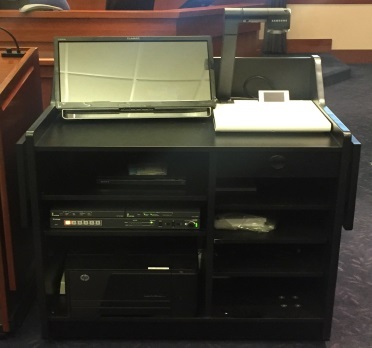 Counsel can bring portable computer equipment to plug into ports to access the electronics in the courtroom. In Albuquerque, the Rio Grande, Chama, Vermejo, Mimbres, Bonito, and 421 Gold courtrooms are augmented by fully integrated video conferencing systems. Video conferencing is also available in Santa Fe in the Aspen Courtroom, as well as in Las Cruces in the Sierra Blanca, Tortugas, Guadalupe, and Mimbres courtrooms. Three fixed video-conferencing cameras are focused on the Judge, witness, and the presenter at the lectern. The equipment can be used for remote witness testimony, pretrial conferences, or other court proceedings. The use of this technology is controlled from touch panel controllers at the Judge's bench and the Courtroom Deputy location. Please contact the Courtroom Deputy of the Judge before whom you will be appearing in order to coordinate videoconference requests. A minimum of two weeks advance notice is strongly suggested for coordination and testing of videoconference events. For training on use of the equipment, please contact the Information Systems Help Desk at 505-348-2110 (for all sites). It is highly recommended that training be scheduled at least two weeks prior to a trial or hearing in which courtroom technology is going to be used. This training will help to identify and mitigate any issues that might arise while court is in session. Please be sure to bring the content you intend to present in Court and the laptop from which you intend to present it, so that all components may be tested. Counsel is encouraged to contact the courtroom deputy for approval to arrange for the use of this equipment. The courtroom technology listed above is available in the following courtrooms, except as noted.